Dr. Donaldson grew up riding hunters and jumpers near Toronto, Ontario. She completed a Bachelor of Science degree at the University of Guelph before attending the Ontario Veterinary College (also at the University of Guelph). After graduation in 2013, Dr. Donaldson completed an equine general practice internship in Alberta, Canada. She then returned to Ontario for a year-long surgical internship. She worked for an ambulatory equine practice in southern Ontario for two years. 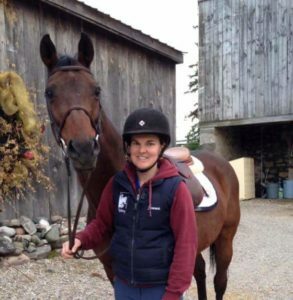 She moved south of the border to join Rhinebeck Equine in 2018. Dr. Donaldson’s professional interests include sports medicine and reproduction. In 2015 she obtained certification in Veterinary Medical Acupuncture from CuraCore in Fort Collins, Colorado. Dr. Donaldson enjoys incorporating acupuncture into her practice. In her spare time, Dr. Donaldson enjoys riding, hiking, snowboarding, and reading. She lives in the Village of Rhinebeck and owns a semi-retired show hunter named Nik.